The desert is a high point trip for many, discover the best of berber Marrakech tours as you make your way to the desert. Majestic Kasbahs , awe-inspiring berber villages and gorges are waiting for you to discover, traverse opulent desert dunes in an excellent camel trek and have an authentic berber night and dinner in a fancy desert camp. You will also Experience a tour in 4×4 and enjoy your Marrakech desert tours 5 days via Merzouga. In the morning we will begin our desert tour from the heart of morocco ” Marrakech ”. Crossing the High Atlas Mountains known Tichka pass. Then, we will leave the main road and take the side road to the Kasbah of telouet, which belonged to the Glaoui family. The place now stands in ruins, From there we will continue along the new and stunningly beautiful road, lunch will be at Ait Ben Haddou. The most famous Kasbah in Morocco and is a UNESCO World Heritage site, which you can visit after lunch. Next, we will go to Ouarzazate and Skoura Oasis, where you will find numerous ancient Moroccan kasbahs, some ruins stand among the palm trees. From there the road goes through Kela’a M’gouna, the Valley of Roses, with a stop to see cosmetic articles locally-made from the valley’s abundant roses. Overnight will be in the Dades gorge (BB). After breakfast, you will start your 5 Days Morocco desert tours Marrakech Fes, by walk to explore the area. Then, we will drive to Toudgha gorges. Lunch will be in the gorges or in the Erg Chebbi dunes. Then, we will continue via the Ziz Valley, to the town of Erfoud and Rissani. We will drive to the desert for a spectacular dinner and night (DBB). End of Marrakech desert tours 5 days via Merzouga in the heart of the Sahara desert. After breakfast at the hotel, we will visit the surroundings of the village of Merzouga, before starting with the camel safari. In the nearby village you will discover the ritual music Gnaw, their life style. Next, we will do hiking over the dunes, and visit the homes of nomads, where many Berber handicrafts are made. Then, we will have a tour in 4×4 back to the hotel where we will find camels waiting for you. You will start another adventure by camel, in which we will be accompanied by an expert camel man. You will walk in the Sahara desert with your camel and you will stop in the middle of the way to see a beautiful sunset. Then, you will continue to you desert camp where you will spend the night in the dunes in a Berber tent. Finally, we will have dinner and sleep with the myriads of stars above of you (DBB). Thinking that your trip is finished well wait until you leave the desert to Fes. After finishing your berber tours Marrakech and grasping the best knowledge about this unique culture, you will continue to Fes. The picture perfect landscape of the Atlas Mountains will fascinate you, while making your way to the cedar forest and Ifrane. 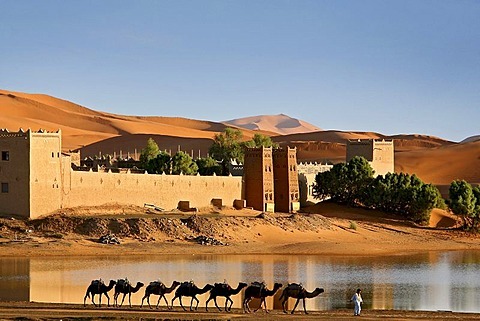 Finish your Marrakech desert tours 5 days via Merzouga into the depth of the history, Fes wih its largest Ancient Medina and narrow alleys will take you to another adventure of the moroccan heritage. Your camel guide will wake you up early in the morning , to watch the best sunrise of your life. You’ll peacefully ride your camel back to the village of Merzouga. After your breakfast, we will drive to fez the oldest city in morocco.On our way to Fes we will pass by the biggest cedar forest in morocco, there we will stop to see the monkeys. Then, we will continue to Fes via ”Ifrane ” the Switzerland of Morocco. Finally, we will drive to Fes overnight will be in the riad in the heart of the medina (BB). After your breakfast in your riad, you will walk to explore Fes the oldest city in Morocco. Fes differs from other cities by its divided Medina which include New Fes (Fes-el-jdid) and old Fes (Fes-el-Bali). New Fes was built in the 14th century, so imagine how old Fes is. This city was founded in the 9th century by the first Muslim dynasty to rule Morocco, the Idrissies. Since then, Fes has always played a pivotal role in the history of Morocco. Fes-el-Jadid is an outcome of the glorious times in 1248 during the conquest of Fes by the Merenids. Therefore it reflects a massive royal city. Most people of Fes continue to live in the old-Medina-city instead of moving to the Ville Nouvelle, the modern urban and more European city. After finishing your visit in Fes, you will go back to the same riad where you slept the first night. Finally, Overnight will be in a riad at the heart of the Medina, end of our Marrakech desert tours 5 days via Merzouga.